After breakfast at your Hotel in Marrakech, depart in 4X4 for Ouarzazate crossing the mountain range of the High Atlas by the Tizin'Tichka pass, the highest of the country. Berber tea in the Atlas Mountains, visit the best known kasbah in Morocco: Ait Benhaddou. After lunch in Ouarzazate, departure to Zagora via the Draa Valley and overnight in a charming guest house. After your breakfast at the Riad, departure for the visit of the Koranic library in the village of potters, then continue the road to M'hamid via the palm grove of Ouladbrahim and its scenic village with lunch served in the nature. 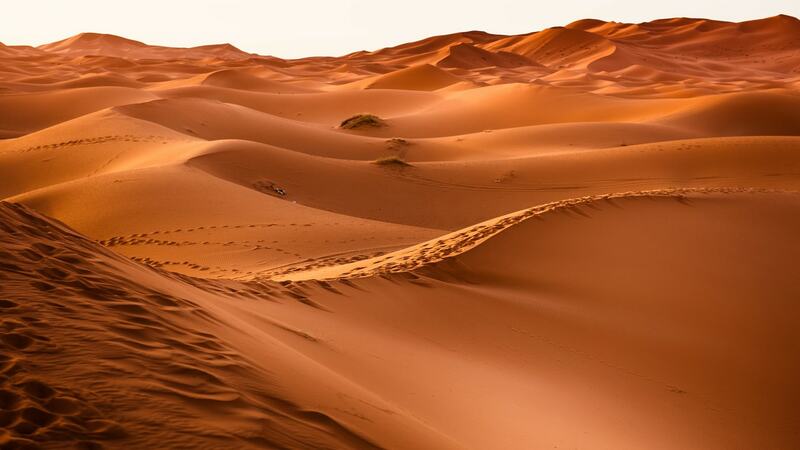 Continue towards the sea of the Chegaga sands which includes the highest dunes of Morocco (300m). Witnesses the sunset, dinner, and night in the bivouac, traditional tents, with very good conditions of comfort and security. After the private breakfast on the dunes you will take a ride on dromedaries and then leave for Foum-Zguid via the old track of Paris - Dakar and the dry lake of Iriqui.Lunch in Taznakht. Marrakech arrival towards the end of the afternoon.